A babywearing parent is a happy parent because their baby fusses less, and grown-up arms are free for doing chores, shopping, etc..
the next generation, while keeping their little ones safe and content using BabyBjörn favorites. Organically grown cotton benefits the environment in a number of ways, such as helping to replenish and preserve soil fertility and allowing for less use of toxic pesticides and fertilizers. (GOTS), the most recognized international organic standard. I could never have survived the first few months of my children’s life without Babybjörn. Disclosure: I received a sample product in order to write this review. I was not paid by the company, and no guarantees were made as to whether a positive or negative review would be written. This is an authentic review. Claire, I have also heard that criticism for Babybjorn, but I have not seen any evidence of hip dysplasia, etc. Both of my kids seem fine, but the Babybjorn is limiting as far as when the babies grow out of it. I think the Ergo may last longer as the child ages. I have also heard and read that the baby björn is not recommended. I read that the legs of a baby should not hang down instead the knees should be at least at the same height as the hips or that when you walk the baby´s legs should not be in your way. I used a baby wrap with my son and loved it. And those you can use for a long time since they´re not really made for a certain height or weight. But it´s still good to hear that such a popular brand like the baby björn offers a greener version now. 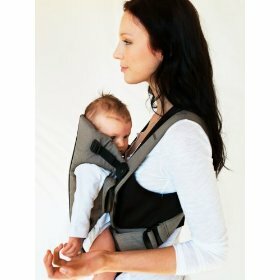 The Baby Bjorn Original Baby Carrier will also adapt as your baby grows and becomes more interested in the outside world. You can have your baby facing outwards and fold down the neck rest so your little one can keep an eye on everything going on around them.